Hair Restoration Peptide that really works in 12 weeks! Regenscalp™ Hair Restoration Set is the product of a deliberate investigation into the chemical signals that control the hair growth cycle. The application of these findings through our advances in peptide biochemistry offers a new beginning in hair restoration technology for both men and women. Regenscalp™ is the first and only product in its class to directly stimulate the Anagenic Growth phase of the hair cycle with growth promoting growth factors for hair. The product is also first in its class to directly suppress the Catagenic Rest and Telogenic Loss phases of the hair cycle. The combined result is a hair restoration product that offers faster results with improved efficacy in problem treatment areas. Additional research focused on the hair growth cycle, with attention to the factors that create a hostile environment for hair maintenance and robust growth. Seborrhea and the scalp parasite Demodex are common stressors that are known to contribute to hair loss. Increasing the blood supply at the hair root has been shown to provide a nutrient-rich environment that favors hair growth. 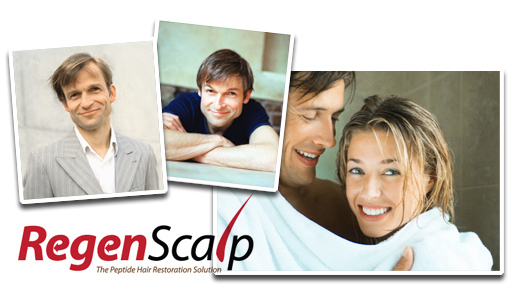 Each consideration has been addressed in the development of Regenscalp™.